When I was 18, I left a scholarship to Southern Methodist University (SMU), in Dallas, Texas to play poker for a living. I’ll never forget the moment I decided. I was sitting on a tanning bed (literally chairs half submerged in water so you could tan in comfort) while reviewing poker hands I had played that week. Highlighting the mistakes in my homework, I realized that if I wanted to make my dreams of traveling the world and playing poker, professionally, come true, I needed to do this every day; moreover, if I went all-in there wouldn’t be time for even commitments like school. I looked around, realized that, in the worst-case scenario, I’d be 19, and broke like everyone else. My best-case scenario was that I’d make it and realize my dream; hence, I quit school. As you can imagine, my parents weren’t exactly gung-ho on the idea of their only child putting their entire stake on a card game. My dad is a conservative, religious man, and my mother had hopes of me working in real estate. Mind you, this was in 2005 before poker evolved to mainstream television and before the success stories of young poker savants crushing the game. For the aspiring esoteric professionals (musicians, actors, painters, writers, poker players), we must first accept the fact that our jobs aren’t socially accepted, that is until we’re successful. Then we skyrocket from the bottom of the food chain to the top. Until then, however, a broke musician who plays on the street hoping to sell his CD, sadly, to most people, is still a broke musician even if he loves what he does. It’s only once someone discovers a person’s talent that he becomes cool. Realize now, there will be a few years gap between grinding and honing your skills to the point where you actually succeed. Until then, everyone thinks you’re just another ill fit, societal outlier. In my experience that’s a good thing; it means I’m probably on to something and that I’m doing the right thing. I use it as fuel for my fire. In every industry, especially esoteric endeavors, confidence is the key to success. It’s a bit of a catch-22 though. We’ve all heard the adage, success breeds confidence, so what do we do before we’re successful? Baby steps. In fact, I take them daily. Instead of tackling my biggest project first thing in the morning, start my day off with three things I know I can accomplish: drink a glass of water with lemon, practice my stretching routine, and then write down five things I’m grateful for. That gets the ball rolling! With a list that easy, how can I fail? Now I’ve psychologically created a state of success fruition. When it comes time to follow my diet, or time to exercise at the gym, or time to outline my company goals, I’m ready for the challenge. After all, I’ve succeeded at everything else I’ve attempted today, so why should this be different? People take you as seriously as you take yourself. As it turned out, my family didn’t have much trouble with my decision to leave college and work full-time, because my actions, my attitude, and my habits forged the feeling—for myself and my family—that I was on the right track. I was mostly doing what I said I would do—playing and studying poker. One of the things I’ve written about in my industry is the importance of acting like a professional. If we want to establish credibility and if want others to take us seriously, we should start by showing it. Successful people have successful habits: they get up early, exercise daily, eat healthy, set goals, study, and endeavor towards improving their craft. They don’t watch TV and party excessively. And not only will it show to whomever you’re trying to impress, but if you’re constantly living the life of a successful person then that reality will manifest itself. Change starts with you so take some initiative. Create a business plan for the year. Without a clear picture of where you want to be, how will you get there? Make clear goals. Aim for your dreams and then worry about how you’ll get there later. The sacrifice has to be worth the payoff or else you won’t be motivated to get there. Be practical. Hire someone smarter than you to map out how you’re going to make money and how long it’s going to take for you to get there. I use an accounting expert to draw models of how much money I’ll need to travel the world playing tournaments and give me estimations based on historical data about the likelihood of my expected win-rate. With a plan like that, I’m likely to get there, or at least as close as luck will allow me. You can also use the free guide to finances that I’ve made available at AlecTorelli.com. Download it and fill out your priorities, ideal cost of living, and goals for the year. Then work backward from there. When you’re dedicated and put in the prerequisite work, then you’re already a success; as a result, the people who care about you will come to respect your chosen path. It can be especially tough to win favor from others when playing poker, where luck is involved. In short, you can be a winning player and still lose for extended periods. The same is true for artists and aspiring entrepreneurs. The road is long and the game has variance. The truth, unfortunately, is that your wife or parents don’t care about that, they just want to see results, since most people will determine your success based on how much money you’re making. To truly win the game, you have to stop trying to explain your job to your parents, family, and friends, and just accept that they may not understand. I stated before, the problem is our cultural milieu doesn’t accept your career path as normal. You, on the other hand, are completely confident and sold with your dream. You’ve spent hours perfecting your craft. So the real problem isn’t you, it’s you’re fear of what others will think of you. There are two pieces of insanity here. For our mere snippet of existence here on earth, we spend our perpetually dwindling time concerned with the type of car parked in our neighbor’s driveway. To add to that insanity, we worry about a reality that does not yet exist—the fear of what other people might think. Dispel those fears: it’s your life, not theirs! We’re all going to be dead soon and nobody will care or remember whether we painted the sky or swept the floor. So just do what you want and forget the rest. I challenge you to watch the incredible documentary, Planet Earth. Observe animals in nature: does the eagle worry about the color of his feathers? Just because human behaviors are insane doesn’t mean it’s easy to overcome; it’s insanity nonetheless. True liberation comes from within. No poker tournament win will make me any more secure than I decide to be, because no external validation can ever provide security. The moment you decide that it’s enough to do what you love, then you’ve succeeded. Because you’re going to have moments where you feel on top of the world and others where you probably question your decision, but that truth is something that nobody can take away from you. Everyone’s definition of success is different. The only way to appease the world’s demands is to stop caring; indeed, relying on social approval is both futile and foolish. You are your own success. So don’t worry about what people say. Do what comes naturally to you and create the best filter in the world by surrounding yourself with people, who love, support, and believe in you. Be yourself because it’s good enough. 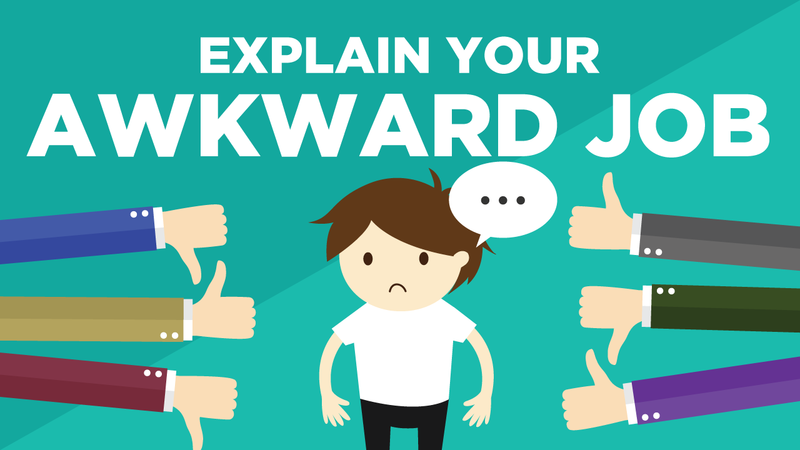 I hope you enjoyed this post on how to explain your awkward job to your family and friends. Please share your thoughts in a comment below. I’d love to hear from you. Alec Torelli LLC © 2018. All Rights Reserved. FINANCES AND CREATING YOUR IDEAL LIFESTYLE.